Caption slip reads: "Photographer: Emery. Date: 1957-08-08. Reporter: Attn: Erwin Baker, City desk. Assignment: Aerials Goodyear blimp. Coastline from Redondo Beach to Playa Del Rey. 30: Hermosa Beach, sand & bathers. 31: Pier with circular platform on outer end -- vicinity of El Segundo somewhere. 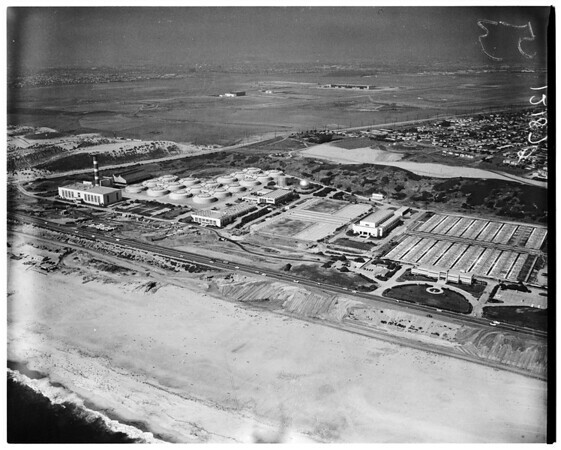 52-53: Oil refinery near Playa Del Rey sewage disposal plant & tanks. 54: Palos Verdes Estates looking NE. 55: New homes of Torrance--Redondo Beach border area, north of Palos Verdes Estates. 81, 80: Redondo Beach pier and breakwater construction. 26, 27, 34, 25, 62, 63: Playa Del Rey area".